Respectful language makes communication more effective in many ways, since it prevents misunderstandings and conflicts. It also reassures patients that you see them as people who have personal and social needs as well as medical needs. Respectful language shows attention, uses descriptive words and is problem-oriented. Showing attention: you are interested and engaged in what is being said, which is also a sign of respect. Showing attention is an important part of active listening (discussed May 2014 and May 2016). Using descriptive words, and not judgmental words, allows you to ask questions and collect information in a way that makes a patient feel respected and comfortable, rather than judged. Problem-oriented language focuses on the patient’s medical issue, in a way that is clear and understandable to them. Here, a stepwise approach is often helpful. A stepwise approach involves approaching a problem in steps or phases, and providing optional statements with a rationale. For more information, tips and examples, click here. What kind of first impression do you make? A first impression is the most important impression you’ll ever make—and you get only one chance to make it. Business deals can be made or broken, first dates become second dates or not, friendships are created or fail to form; everything hinges on that all-important initial encounter. And yet most of us don’t know how we’re really seen by others. 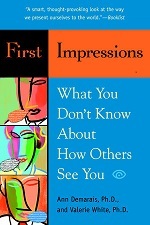 Many of us don’t know how to make a good impression…shop the book. Background: Symptomatic investigation and treatment of unexplained physical symptoms is often attributed to patients’ beliefs and demands for physical treatments. Aim: To test the influential assumption that patients who present symptoms that the general practitioner (GP) considers to be medically unexplained do not generally provide the opportunity for discussion of psychological issues… read more. Published in GI-Mail 02/2017 (English + German edition). Sign up for GI-Mail here.